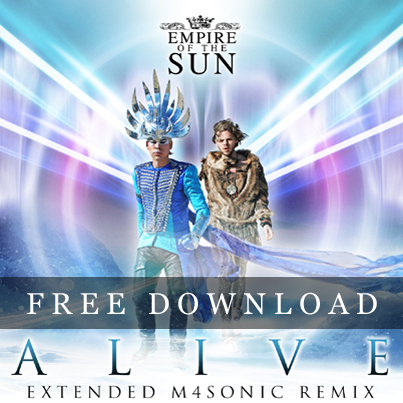 Empire Of The Sun’s long-awaited sophomore album ‘Ice On The Dune’ is now just over a week out from release, so the boys are drumming up a little bit of support for it by setting a remix of lead single ‘Alive’ free. ‘Alive’ is still rattling around in the ARIA singles charts, currently sitting at No.41 and just two places shy of its peak thus far. A remix package, featuring four remixes, was released early last week. And while the ‘M4sonic’ radio edit was part of it, the extended version of the remix is still unreleased. But no longer, with the band giving it up as a free download today in return for your email address. Simply click HERE to find out how to get your copy.